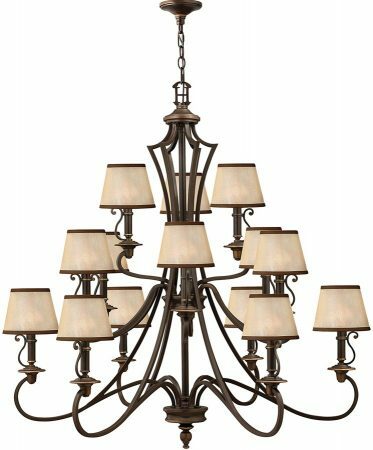 The Hinkley Plymouth large 15 light hand-rubbed old bronze finish chandelier with amber shades is classically inspired, supplied by Elstead Lighting and designed by Hinkley. 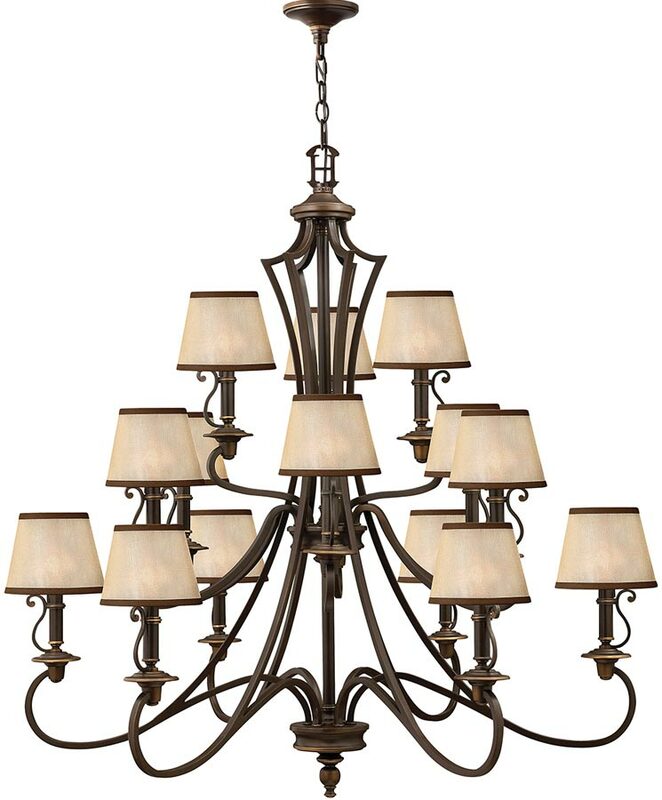 A very large fifteen-light three-tier chandelier finished in rich old bronze. Suspended from a circular ceiling mount and chain linking into the decorative hook on the central body. The centre body supports six heavy square section curved arms on the lower and second tier and three on the top, finished beneath the sweeping open vase shaped frame with a decorative finial. The candle holders are a distinct feature of this fixture, with wonderful scrolled handle finials resembling those from hand held candlesticks. The light amber organza shades are trimmed top and bottom in mocha to match the old bronze finish. Period homes call for designs to sympathetically compliment existing features and décor. Lighting fixtures play a large part in maintaining the overall effect you require. This wonderful scrolled metal-work chandelier has three tiers of six, six and three lights which surround the centre arc shaped old bronze frame, creating a timeless addition that will suit perfectly. Space is a necessity to display this spectacular chandelier, the diameter is 113mm. However it is the height that will need careful consideration. Perfectly suited for larger period receptions, drawing rooms and stairwells. This elaborate and elegant light is designed in the USA by Hinkley Lighting, founded in 1922 in Cleveland, Ohio. They have transformed from a small outdoor lantern company to a global brand intent on bringing you the best in style, quality and value, such as the Plymouth large 15 light hand-rubbed old bronze finish chandelier with amber shades you see here.